Wavecrest - International Vehicle Shipping. Overseas Vehicle Shipping. Wavecrest Limited specialises in the movement of all types of vehicles including classic cars, limousines, 4 x 4's, vans, trucks, motorhomes and motorcycles. Over the years our clients have included vehicle dealers, US and UK military personnel, vintage vehicle enthusiasts, premier league football players, Hollywood actors and even Royalty! We regularly export vehicles to countries including the USA, South Africa, Australia, New Zealand, Namibia, Jamaica, Malta and Cyprus. Vehicles travel aboard modern purpose built roll on/roll off (ro/ro) vessels or are packed in containers where appropriate. Depending on destination, motorcycles can be shipped ro/ro or export packed in crates for safe transportation. We have regular vehicle import shipping services from the USA to the UK. Cars and motorbikes can either be delivered into our receiving depots in California, New York and Florida or alternatively we can provide a collection service from most parts of the USA. Our ex-pat owned US agent handles export clearance formalities on our behalf and arranges for cars and bikes to be safely loaded and secured into containers. On arrival in the UK we arrange for import clearance at the port of arrival and payment of any applicable duties and taxes to HM Customs on your behalf. After clearance, vehicles are made available for collection from our UK depot. If it is more convenient, we can also arrange for vehicles to be delivered through to your residence at competitive rates. If you are purchasing a vehicle from a dealer in Japan they will generally arrange shipping on your behalf to a UK port, however, they do not usually take care of the import clearance once the vehicle arrives. Wavecrest Ltd provides competitively priced Customs clearance services at all major UK ro/ro ports including Bristol, Southampton, Sheerness and Tilbury. If vehicles are shipped in containers, we can arrange from them to be Customs cleared and unpacked at one of our depots. What does it cost to ship my vehicle overseas? Prices are determined by vehicle size (length, width and height), origin and final destination. Please complete our quotation form and we will come back to you shortly. We would recommend that marine insurance cover is arranged for overseas vehicle shipments. Please contact us for further information regarding insurance. Will import duties and taxes apply on entering my vehicle into a foreign country? This will depend entirely on the country of destination and the circumstances of the importation (i.e. if it is a commercial transaction or change of residence etc). We would strongly recommend that you check local import regulations in the country of destination prior to shipment. Yes, there will be charges for local handling, customs clearance etc. at the destination port. Costs will vary from port to port and country to country. Will there be anybody to assist me with the customs clearance and pick up of the vehicle at destination? Wavecrest has an extensive network of reliable agents around the world who can assist with local customs formalities. What do I need to do in order to prepare my vehicle for shipment? The vehicle should be clean and the fuel tank no more than a quarter full. Personal effects should be removed from the vehicle before shipment to prevent customs clearance delays at destination. 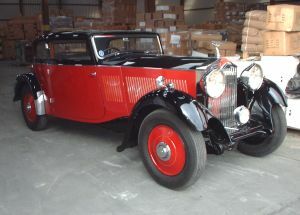 A 1933 Rolls Royce was recently imported from Miami. The owner purchased it at auction after discovering it had originally been owned by her grandparents. 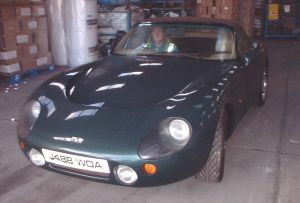 Loading recently took place of a TVR Griffith car which was en-route to Australia. 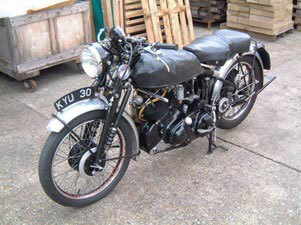 Export packing a vintage Vincent Black Shadow motorbike for safe transport to Edmonton, Canada.